When you go camping, you have a few different options when it comes to sleeping mattresses. Just because you are enjoying the natural environment does not mean you have to give up all of your comforts, especially when it comes to your sleeping arrangement. Air mattresses have been a popular choice for camping but some prefer foam mattresses because they are often more comfortable and you never have to worry about them deflating. Foam camping mattresses have a larger packed size than air mattresses so be sure you will have room for one. If you are looking for a good camping foam mattress, check out our list below of the top 5 currently on the market. This folding mattress can also be used as a chair when not in use. This makes it ideal to use for camping since when you aren’t using it, you can just fold it up and put it out of the way, or you use it as a comfortable chair or sofa. You can use it to sit on to enjoy the campfire. The zippered removable cover can be removed and washed. The carry handles make it easy to take along for your camping trip. The LUCID Folding Mattress comes in 5 different sizes to meet all of your needs. It is also lightweight so it won’t be a burden to take along with you. This memory foam mattress allows you to take luxury with you to the outdoors. 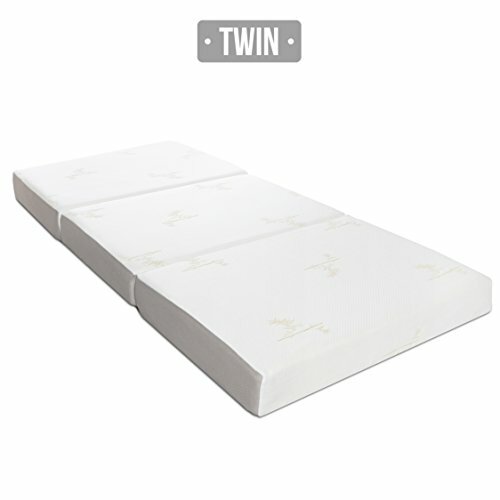 It offers 4 ½ inches of medium-firm polyurethane foam, topped with a 1 ½ inch layer of spongy soft memory foam. This combination provides the perfect balance of support and softness. When not in use, it folds up for easy storage or for keeping out of the way during the day while you are camping. The ultra-soft bamboo cover has an anti-slip bottom so it won’t move around while you sleep. After your camping trip, you can wash the removable cover. This sleeping mat is constructed of a 1-inch base support foam, 2-inches viscolatex responsive foam, topped with 1-inch of memory foam. The combination of these layers provides the ultimate support and comfort. The memory foam is the Zinus BioFoam which is infused with natural ingredients. The BioFoam helps keep your mattress fresh by absorbing moisture and eliminating odors. When you aren’t using the mat, you can fold it up to get it out of the way. Featuring open-cell polyurethane foam, this sleeping mat is comfortable and can be rolled up when not in use. The compression straps with buckles allow you to roll it up tightly so that it is easier to transport. The foam maintains its shape no matter how many times you roll it up. The built-in carry handle makes it easy to carry. The corner tie downs allow you to tie the pad to any cot that has exposed bars. Or you can use it on its own. The integrated pillow pocket helps keep your pillow stay put as you move around during the night. This camping mattress also has a soft brushed canvas shell that is removable to make cleaning easier. You can store your small items like wallet, keys , or flashlight in the zip pocket. Featuring a double-stitched cover with a double-overlapped folded seam, this camping mattress with foam is super durable and perfect for using outdoors. The Tri-Fold Hide-A-Mat folds up easily, making transport a breeze. During the day when you need more room in your tent, you can fold it up to get it out of the way. You can use this mat when you aren’t camping as well. It is great to use as a play mat for kids, for sleepovers, and makes a great exercising mat. This foam sleeping mat comes in a variety of colors so you can pick the one that fits you the best. 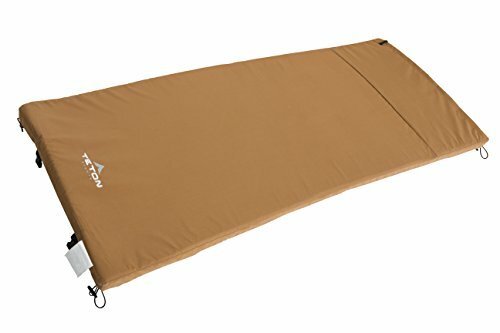 Foam mattresses for camping can make your trip a lot more comfortable. They are great if you plan on taking an extended camping vacation. A good night’s sleep is important when you are camping and it depends on the kind of sleeping gear you buy. There are many options for camping foam mattresses. If you want to go for ultimate comfort, you can look for a memory foam camping mattress. They are super comfortable and also have various health benefits. You also have the option of choosing a foam mattress that folds up to double as a sofa or chair. This can come in handy during the day when you need someplace to sit and relax. Whichever mattress you pick, first decide which features mean the most to you so you can pick the mattress that best fits your needs.